The Church is nourished spiritually at the table of God’s word and at the table of the eucharist: from the one it grows in wisdom and from the other in holiness. In the word of God the divine covenant is announced; in the eucharist the new and everlasting covenant is renewed. The spoken word of God brings to mind the history of salvation; the eucharist embodies it in the sacramental signs of the liturgy. Recently we looked at the increased use of scripture in liturgical celebrations since the Second Vatican Council. The ambo, then, as the place where the scriptures are proclaimed, needs to be a permanent, prominent place suitable for its liturgical function. Its use is reserved to the proclamation of the readings, the responsorial psalm and the Easter proclmation. It may also be used for the homily and the prayer of the faithful. There must be a place in the church that is somewhat elevated, fixed, and of a suitable design and nobility. It should reflect the dignity of God’s word and be a clear reminder to the people that in the Mass the table of God’s word and of Christ’s body is placed before them. The place for the readings must also truly help the people’s listening and attention during the liturgy of the word. 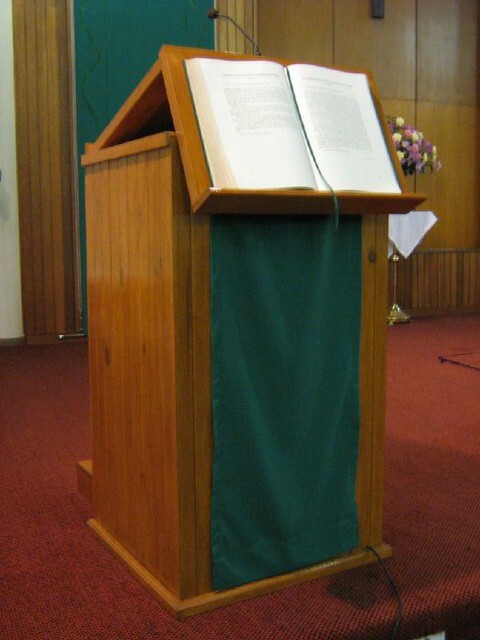 Great pains must therefore be taken, in keeping with the design of each church, over the harmonious and close relationship of the lectern with the altar. During much of Ordinary Time this year, we will listen to readings from the gospel according to Mark. For Sundays we have three years worth of readings. 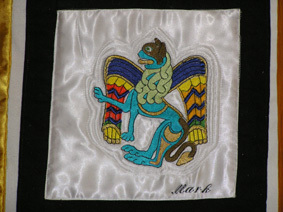 Year A is comprised mostly of Matthew; Year B, Mark; and Year C; Luke. Parts of John are proclaimed during the Easter Season, and on other feast days and occasions across the three-year cycle. It has not always been this way, however. For a long time the same readings were proclaimed every year. In the first half of the 20th century, biblical scholarship began to develop once again in the Church. This was reflected in the proceedings at the Second Vatican Council, which began fifty years ago this October. The Council’s Constitution on the Sacred Liturgy spoke of the importance of scripture in liturgical celebrations, and called for the larger, more extensive collection of readings we use today. On Tuesday, Fr Edward McNamara, regular liturgy contributor for the Catholic news site Zenit, published his usual “Q & A” style liturgy column for the week. This week’s article responded to the submitted question of whether a song, perhaps relating to the second reading or the gospel, could be used in place of the responsorial psalm. Fr McNamara quite rightly answered this question in the negative, referring to no. 61 in the General Instruction of the Roman Missal. This matter of the responsorial psalm is frequently misunderstood by music ministers and others. The main reason for this, I believe, is that in the celebration of Mass, music is normally used with a ritual action. We typically see music accompany processions and the like. Yet in the case of the Responsorial Psalm, the music is the ritual action. A clear understanding of the parts of the Mass and their purpose is crucial. Common or Seasonal Psalms. Not all parishes may be able to learn all the psalms in the lectionary, but learning a collection of core psalm repertoire for each season of the year is by no means impossible. There are only 20 common psalms for all four seasons of the Church year (which isn’t much given that’s every Sunday across the three-year cycle). Our own parish music suggestions resources recommend a common psalm for each Sunday. Psalms in Metrical Form. Many composers have set psalms to more song- or hymn-like forms of music, which music ministers may find easier to learn and use with their assemblies. Take care, however, with such settings where it says the lyrics at “Based on…” the psalm. Some composers alter or vary the words of the psalm, and some may bear little resemblance the the version you will find in the lectionary. Others are much more faithful to the psalm text, and/or quote it directly. Chant. I’m not saying you need to learn Gregorian chant here. If you do have music for the response, then with knowledge of a few chords, you can easily chant the lines of the psalm on a single note. The psalms of Michel Guimont may help here, but they can be even simpler than that if you wish. Sing the Response Only. If your parish lacks the resources to sing the entire psalm, then perhaps the best alternative is to sing the response only, then have a Minister of the Word proclaim the verses from the lectionary. Like all things in liturgy, the documents set forth the principles and guidelines that underpin what we do and articulate for us an ideal to strive for. Given the great diversity within our Church, we also have some accommodations that allow us strive towards those ideals in light of the nature of each worshipping community. The Responsorial Psalm is a case in point. Although I would recommend to any liturgical musician that they visit their nearest Catholic bookstore that sells music (such as Pauline Books and Media, for example) and look at the collections of psalms that are available. A number of composers have set the entire three-year Sunday cycle of psalms to music, and some are quite simple and straightforward to use. Our parish’s celebration of Christmas required the assistance and hard work of many parishioners. My sincere thanks go to all of the liturgical ministers who served our community, both during the liturgical celebrations themselves, and in the “behind the scenes” work that took place. The commitment these people make to our parish can never be taken for granted. With the conclusion of last Sunday, we entered the season of Ordinary Time. The term “Ordinary” is used to describe the season because the weeks are numbered from the first to thirty-fourth week. Those who have been to Mass during the week have already entered into this season. The rest of us get our first taste today with the Second Sunday in Ordinary Time (it’s the second Sunday because it’s the Sunday that begins the second week). In Ordinary Time, the general pattern of the gospel readings is for us to listen week by week to excerpts that progress through one of the gospel books. 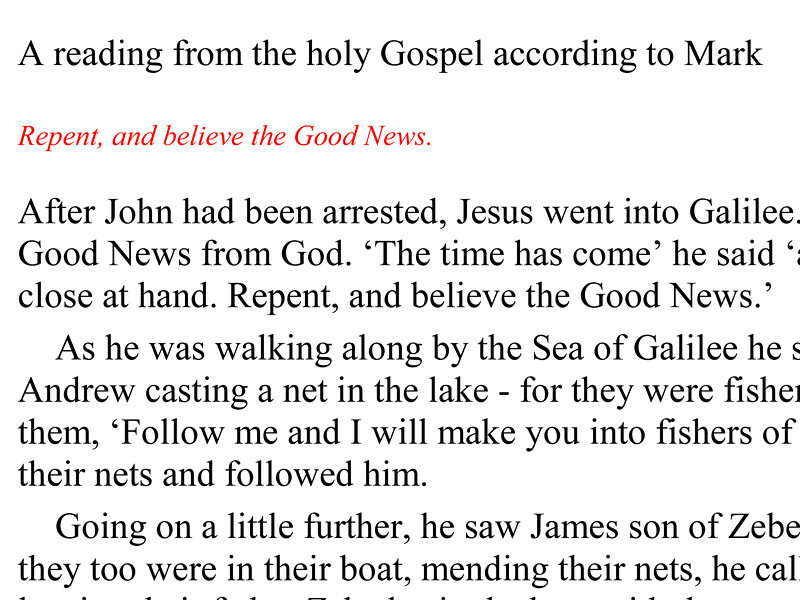 Year B focuses on the gospel according to Mark, with some inclusions (like this week) from the gospel according to John. Thus various aspects and events of Jesus’ ministry are proclaimed for us in the weeks from now to Lent, and from after Pentecost until the feast of Christ the King in late November.